… because, of course, the skies just opened. If you had your spray done today though, not to worry …. first of all, it only needs about half an hour between the spray and the rain for the rain to have minimal/no effect…. and all but the last one or two trailers he did this afternoon had more than that…. but he’ll be back again in the next day or two to finish up with others anyway, so will do some touching up just to be sure. The Brown Recluse Spider (Loxosceles reclusa) is also known as the violin spider or a fiddleback because of the violin-shaped markings they often have on their thorax. They are known to live in United States of America, Mexico and Canada. 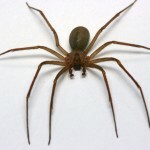 Check out our blog post about brown recluse spiders here. If you have carpenter ants, spiders, or any other pests (well except for the ones you brought into the world yourself), give us a call at (705) 534-7863 or email us at ccpestcontrol@gmail.com and we will solve it. Serving Victoria Harbour, Barrie, Midland, Orillia, Muskoka, Tiny, Tay and Simcoe County as well – and pretty much anyplace in and around these areas. Island and weekend calls, no problem. Bees, Hornets & Wasps…Oh My! Bees, wasps and hornets are not always well-liked, and it is totally understandable, but there are some benefits to having them around. Do you know what the benefits are or the differences between the species and their hives? Click the following links to read all about them! Here’s a blog post we did that includes a link to an interesting story about why you shouldn’t always wait to call a pest control business if you have a problem. If you have any questions or concerns please give Cottage Country Pest Control a call at 705-534-7863 or email us today. We are always happy to help you to solve your pest problems. We are based in Victoria Harbour, but cover Barrie, Midland, Orillia, Muskoka, Tiny, Tay and Simcoe County as well.